On April 18, England’s Foreign and Commonwealth Office (FCO) will begin releasing the first group of sensitive documents related to the decolonization of 37 former British colonies. 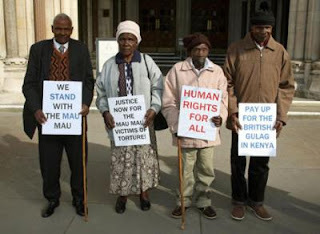 The release of the documents was the result of a High Court hearing in London during April 2011, which centered on four elderly Kenyans, who were labelled as suspected Mau Mau rebels by the British government, and thus experienced abuse, torture, and illegal imprisonment during the Emergency period of the 1950s. Nearly 50 years after the widespread repression and eventual process of decolonization, the case brought forth by the four Kenyan pensioners against the British government has the real potential to be regarded as a “Colonial WikiLeaks,” and quite possibly lead to the rewriting of the established narratives of decolonization and independence not only in Africa, but also throughout the Caribbean and all former Commonwealth colonies. The four claimants, Paulo Nzili, Ndiku Mutua, June Muthoni Mara, and Wambugu Nyingare are seeking compensation and an apology from the British Government for alleged torture they experienced while detained during the Mau Mau rebellion—one of the bloodiest conflicts of the colonial era. In April 2011, the High Court was given the responsibility to determine whether or not the British government had a direct role in the charges laid by the prosecution. The British Foreign Office denied any responsibility for the events in Kenya, claiming that all liability for repressing the Mau Mau rebellion had been transferred to the independent government of Jomo Kenyatta in 1963. Judge McCombe blasted the Foreign Office for such a “dishonourable” argument, and allowed for the case to be heard at a full trial, starting in early 2012. In an effort to build evidence for the prosecution’s case prior to April 2011, a search for documentary evidence which would corroborate the testimony of the four plaintiffs began in England—as no such papers existed in Kenya. It was long suspected that any sensitive or compromising documents from the former colonies were sent back to England to be destroyed, as large gaps existed within local archival records across the former colonies. During the investigation, the prosecution and honest civil servants assisting on the case were routinely dismissed, being told that no documents existed on former British colonial activities in Kenya, or anywhere else for that matter. Due to the intensely thorough investigation on behalf of the prosecution and British civil servants, it was revealed that documents had indeed been illegally removed from Kenya on the eve on independence, and were being stored in the FCO at Hanslope Park. The collection on Kenya contained over 1,500 files, in some 300 boxes—taking up 100 linear feet—not something which could be easily missed. The prosecution was informed that the documents were crucial to their case, as they contained meticulously outlined colonial intelligence reports detailing collective punishments, abuse, and illegal imprisonment in detention camps. In short, the documents largely corroborated the testimony of the Kenyan plaintiffs, and also revealed a vast amount of new, previously confidential information about British activities in Kenya. It turned out that the discovery of the Kenyan documents was just the tip of the iceberg, as the embarrassment due to the Kenyan revelation led the British government to admit that FCO “irregularly held” more than 8,800 files (referred to as the Migrated Archives) relating to at least 37 other former British colonies—including the Caribbean during the period of 1920-1962. It turns out because the sensitive documents were illegally and secretly removed from the colonial territories on the eve of their respective independence, they were not listed under the Freedom of Information Act, and were essentially forgotten. Furthermore, because the documents were forgotten, no decision was made by the Lord Chancellor's Department (now the Ministry of Justice) to classify them as compromising or relevant to the interests of national security, they now enter the public domain. The release of the Migrated Archives brings forth the very real possibility of rewriting Caribbean history, as the presence or extent of any hidden collaboration between Caribbean independence leaders and the colonial office will be revealed and finally set straight. This is incredibly important, as so much of the real history of the Caribbean colonial era, such as the violent repression of the 1930s labor strikes, was hidden in government offices or in backroom deals. For the first time, Caribbean scholars will be able to read the full extent of co-ordinated British repression and their concerns for the region in the future. Lastly, we must not forget that the British government was incredibly weary of progressive leaders like Guyana’s Cheddi Jagan—whom they overthrew in a coup d’etat in 1953, and it is likely that more details of their operations against him, his government and potentially other Caribbean leaders will be revealed in the Migrated Archives. In the next part of this article, I will speak in detail with Dr. Robert Hill, Professor of African American and Caribbean History at UCLA, and a leading figure on the Migrated Archives, to gain some insight into their relevance to Caribbean history.